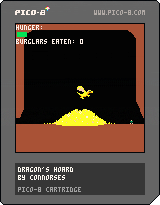 In this game, you are a golden dragon protecting your pile of treasure (read: and also using said pile to lure delicious people into your cave). You're very large so moving around makes you hungry. Eat the thieves trying to steal your gold to gain points! Round ends when someone escapes with a piece of your treasure. Note that there IS a fullscreen button within the game's webpage. The dragons breathing animation was a nice touch. All the pieces that make this game are really well done. graphics, audio, game mechanics are all well polished. This is a game that could eat up coins back in the golden age of arcade games! Nice game! Idea and controls are great. Got a little samey eventually, the difficulty seemed to cap out... Maybe I wasn't playing for long enough? Yeah, the difficulty caps out. The plan was to try and add more enemy types and maybe even give the dragon another ability, but I didn't get that far. Looks like I won't even have it for the jam. :/ I also would have liked to work on the music a bit more. But overall, I'm happy with it. This is really nice. A very polished piece of work. Takes one mechanic and runs with it. Enjoyed the game, especially that music at the start. very nice. Was hard to tell at what point they would steal gold and was a little sad to find I lost when only one piece was taken. Art represented everything it needed and I love the movement + hunger system. Also saw you tried to play my game. You must of caught it on the re-upload for the Credits page. I really dig the music - great idea and executed well! Great game, lots of fun. Nicely put together. Well done! I ended up getting 36 burglars. I really liked the music. Nice idea. Really liked the camouflage mechanic and art used for it. Simple, but very well done. Controls felt good, graphics were cute. I think the little touches of the dragon breathing, and his flying animation, were excellent choices. It made the character feel real. I enjoyed playing, but things did get repetative somewhat quickly. I'm glad to see you used the pico-8, and am looking to see a post-compo version. I liked the breathing dragon. That was cool how you took such simple style and made it tell so much about what characters were doing. Nice retro game, it is even adictive. Well done! Great game! And a very nice use of the theme:). At the beginning it was a bit frustrating because everybody escaped and my dragon was starving, but then I discovered the stealth system :). As other people say, eating those thieves is very satisfying. Good job! Always great to see PICO-8 games. Add me to the list of people who love the breathing animation. Also, I thought it was cool how when I first saw a little 10 pixel burglar of a different color, I could just tell that obviously was wearing armor because he walked slower. I like that kind of attention to detail. A hard game, mostly because it's hard to judge how close you can be before the people run away, and they come from both sides. I really would have liked a long range fire attack so that I wouldn't have to keep moving back and forth. The game functions well, but more variety would have made me want to play longer. I quickly got the impression that the game was going to be more of the same as time went on, and I'm not into just trying to get high scores. The best aspect was the mood, which made the whole experience enjoyable, while it lasted. I like it. Felt like a Commodore 64 game. The idea of a dragon as an ambush predator is terrifying. I give it 5 Cookie Cats. Loved the camouflage mechanic, I found that waiting for burglars to take some gold just before eating them was usually the most effective strategy. The music is dark and gloomy, and I like your art style. Well done!